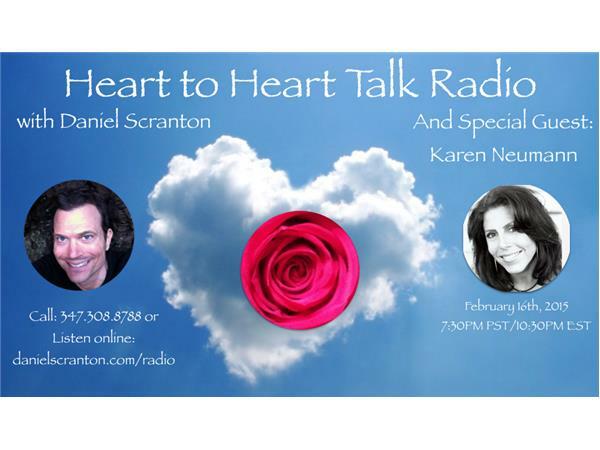 On February 16th, 2015 at 7:30PM PST/10:30PM EST, join me and my guest Karen Neumann for an evening of high frequency conversation and channeling. Karen Neumann is a singer, fellow Enlightenment Evolution Radio host, and a wonderful verbal channel. Karen and I will be discussing her journey and she will channel Theos for the listeners and callers with questions. So please call 347.308.8788 to listen in and/or ask Theos a question. Not familiar with Karen and her work? Visit: http://aboutoneness.com. For more on my work, please visit http://danielscranton.com. And for all previous radio shows, visit: danielscranton.com/radio.